Champeens! 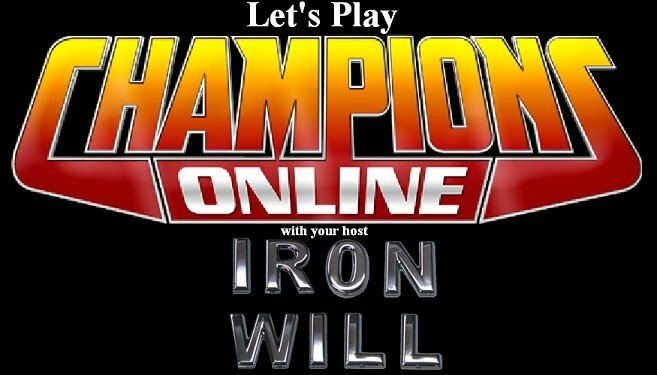 (Let's Play Champions Online): Back to the "action"! 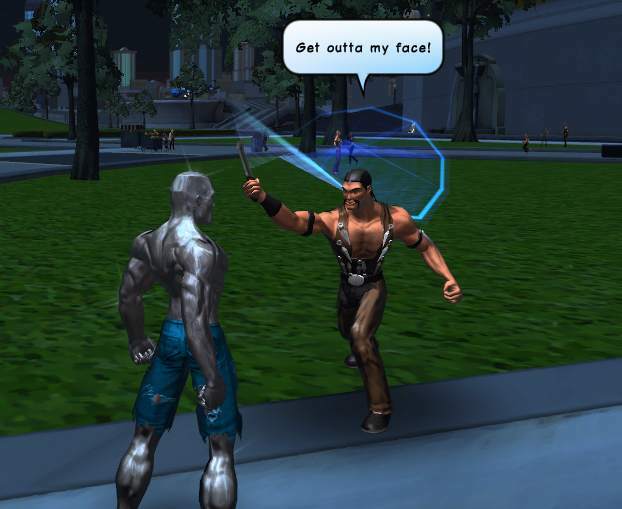 At last, our hero Iron Will makes good on his promise to the heroic Defender to go and bother people in the park! Action! Adventure! 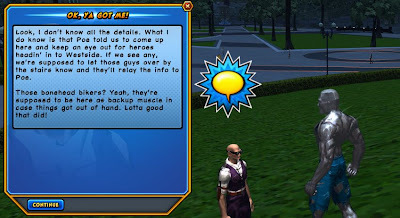 Okay, so as an official I'm-not-sure-what-my-job-title-is, my first job is to go and bother suspicious-looking characters in the park for the leader of the world's premier superhero team, who's too busy standing in the middle of the sidewalk about a quarter mile away to do it himself. Fair enough, I suppose, I'm the new guy. Let's get this done. I'm not really familiar with the various gangs at large in Millennium City, but judging by the matching vests and the fact that one of them has no fewer than ten knives clearly visible on his person, I'm guessing Defender means these guys. They're kind of just hanging out in the park at night minding their own business, but I suppose I might as well do as I'm told and question them. I approach one in as non-threatening a manner as possible. "Excuse me..." says I. He immediately stabs me with a combat knife while his buddy starts shooting me in the chest with some sort of a large calibur handgun, both resulting in an anticlimactic series of metallic clinking sounds. Now, I consider myself a relatively patient person in general, but their use of deadly force in lieu of a "hello" back has brought me around to Defender's way of thinking in regards to these particular citizens hanging out in the neighborhood park. What if KIDS were playing here, man? Some kids die when you shoot them ONCE! So I go about bludgeoning everybody I see with a certain kind of vest on to death with weighted steel fists. Superheroically. About half a dozen utterly one-sided clobberings later, they finally deign to talk to me. Huh. 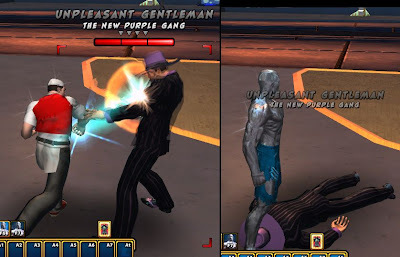 So apparently, some guy I've never heard of told them to back up some guys in purple against cops or superheroes. My keen detective mind is sensing a clue here. Having had no idea what the other gang might look like until a few seconds ago, I wander through the park in search of some guys in purple, and find them over by the fountain, again mostly minding their own business. Once again, I'm treated to an alarmingly sudden attempt on my life. 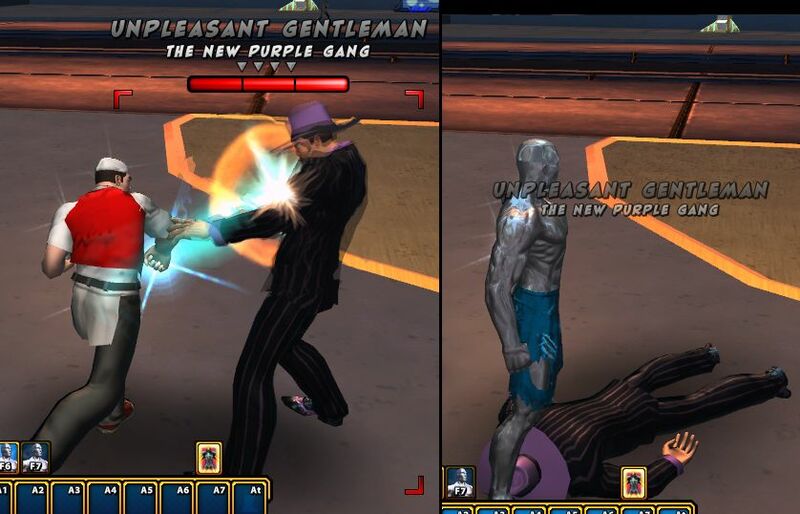 Several minutes of ineffective gun violence and horrifically effective fisticuffs later, the purple gang agrees to give me the time of day too. Once again, somebody I've never heard of has told these guys to come here and not fight with the bikers. Near as I can tell, this means approximately squat. The important thing to focus on, though, is that I, not unlike Batman, have successfully beaten up bad guys and intimidated them into giving me information. 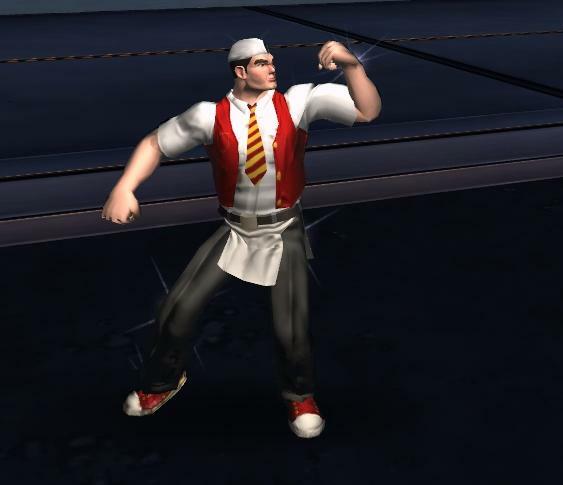 Swaggering a little, I head over to the nearest Socrates terminal to report my findings. Socrates claims that it has information from an anonymous caller that the Purple Gang, which is apparently the gang's real, chosen name, is extorting money from the local vendors in the park. Naturally, they're careful never to do so when a police officer or superhero is around, so they don't have any hard evidence. 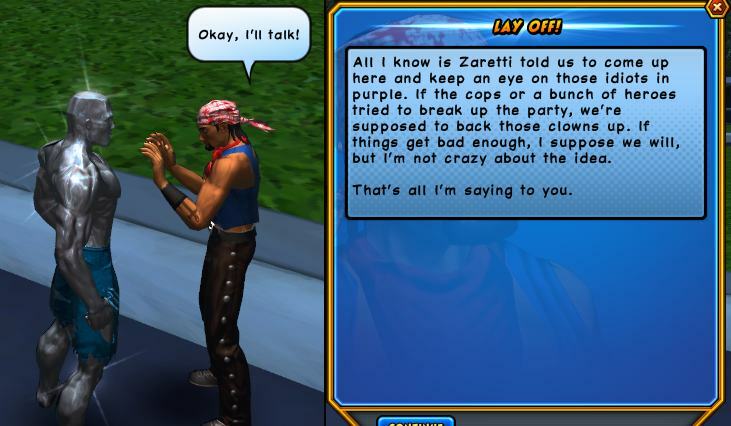 What Socrates suggests I do is disguise myself and see if I can get them to do something illegal in front of me. I have my suspicions. First, an anonymous call doesn't seem like a very trustworthy source, and second, Socrates doesn't seem like a very trustworthy source. Still, I did just spend the last ten minutes in open warfare with these guys and came out of it with nary a scratch, so I suppose that in the worst case scenario I'll be discovered and shot at ineffectually. Fair enough! I head back across the street to the park to see about finding a disguise. "I need your clothes, your boots, and your flower cart." I talk to one of the flower vendors across the street and ask if I can borrow a uniform. He tells me that he has a family and a business to think of. I insist I'll protect him. He says the gang members know where he lives. I tell him that's almost certainly a bluff. Finally, he agrees to give me a spare uniform so that these guys will rough me up, too. Score! I was expecting a simple vest and hat, but bizarrely, the uniform comes complete with pants, shoes, a wig, and enough Caucasian skin-toned makeup to cover every inch of exposed skin. I um... I have no idea what this flower company is about, but I'm fairly certain that I'll have to start investigating them almost immediately after I'm done investigating the purple gang. But either way, it's one of the most undeniably effective disguises I've ever seen when I'm done. I certainly wouldn't recognize me. 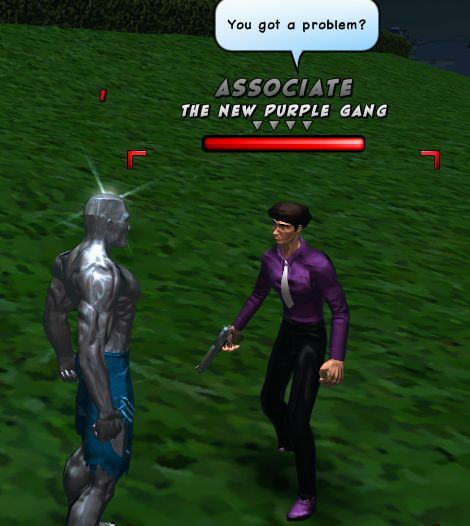 Almost as soon as I get back to the park, one of the guys in the purple suits waves me over, calling me "new guy". Here we go! He tells me to put my profits in my wallet and walk over the sewer grate to the west of the fountain, then to drop my wallet. And, of course, to remember that he knows where I live. Alright, that's all the clue I need. I haul off and cave in his sternum with a right hook, and somehow in the process not only tear my new uniform to shreds but also slough off every inch of makeup I'd so carefully applied earlier. See, this is why I can't have nice things. Alright, that done, I head over for to the fountain and look for this sewer grate. I figure if I can squeeze through it (or, more likely, smash through it) and wait at the bottom, then I should be able to find out who's been collecting all this money. Brilliant plan, if I do say so myself. Just as I'm about to pry up the grate, though, I get a call from Defender. ... Oh. Good. Defender's coming with. That'll make this way less annoying. I sigh, plug my nose, and drop down into the sewers beneath Millennium City. It's all for a good cause, I keep telling myself. Up Next: Showdown in the sewer! Good enough for the ninja turtles, good enough for me.